Last week I wrote about using the link between smell and memory to aid learning. This week, it might be interesting to consider the significance of being hypersensitive to smells (hyperosmia). Sensitivity to smells are fairly common in children who have sensory processing irregularities. Such children are also frequently picky eaters and may be anxious, quickly experience sensory overload with lots of meltdowns and find it difficult to calm themselves. Smell affects the workings of our nervous system – in particular, the system that controls our flight or fight response to triggers in the environment. This means that some smells can trigger negative reactions (causing fear, aggression, withdrawal) but others can work positively, calming the system down and helping to regulate feelings. 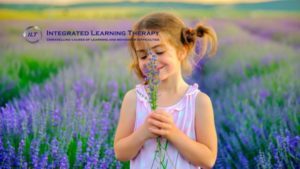 The key is knowing which smells to avoid and which to use to help the child restore or maintain emotional balance. Some smells can even cause a physical reaction, such as gagging or vomiting. The child may show flushed cheeks, develop a headache and even a slight fever. This is not deliberate ‘over-reaction’ of the child in an attempt to avoid a situation but a neurological response originating from a powerful sense! On the other hand, other smells may help a child feel ‘grounded,’ in control and even improve attention, focus and task completion. Some children cannot cope with perfume, food cooking, the smell of room fresheners, aromatic candles and even their own smells emanating from toilet use. Try to exclude these as much as possible and if you know you’ll be taking the child into an environment that will unbalance him, teach him how to use nose plugs. These can be a life-saver! Keep windows open during and after cooking to freshen the air. Do keep your house as well-aired as possible. Experiment a little to find one or more smells that have a positive effect on the child. A shop supplying essential oils will be able to suggest which oils are suggested for varying sensory needs. For example, lavender has traditionally been associated with calming. If it works for your child, use lavender soap in the bath, essential oils in the home and so on. Remember though that a little goes a long way – you don’t want to overdo it. At this point, it might be helpful to focus on children who are picky eaters. Some picky eaters avoid certain foods because of the smell rather than taste or texture. You need to respect that they really are sensitive to the smell of these foods but, at the same time, know what to do. You can’t avoid ever cooking certain foods again, after all! Try to involve the child in finding helpful ways to avoid distressing mealtimes and desensitise themselves to smells they can’t tolerate. For example, warn the child that you’ll be cooking the offensive food and ask her to open windows to help dispel the odours. Even better, have the child help you to cook the food. Raw broccoli, for example, is often tolerated but as it cooks, it emits a stronger smell. If the child is helping you cook it, she gradually becomes more and more aware of the smell, which might help her adjust rather than entering the kitchen to be overwhelmed by the surprise of cooking broccoli. If food offends at the table, try moving it away from the child, or covering it up. Also try putting a drop of a favourite essential oil on her wrist so that she can use that to override the smell of food at the table. Lastly, if you are the parent of a smell-sensitive child, you’ll know to avoid scents in your home. But what about the school? Some children are thrown by the smell of the cleaning products used in the bathrooms and other areas. They can also be tipped off-balance by the products used innocently by teachers. For the sake of those relatively few children, schools should be encouraged to use natural products with as little odour as possible to maintain hygiene, and teachers should be made aware of the possibly negative effects of perfumed deodorants, perfume, scented soaps and hairspray. Minor changes can have big effects on the lives of small people!